It’s been a bit of a meat-fest around here lately so let’s lighten it up, reduce our carbon footprint and save a few bucks as well. I came up with this dish just before we left Barcelona in anticipation of heading to Morocco. I got us in the mood with a good dollop of fiery harissa in a vegan meal that tastes suspiciously meaty thanks to those gorgeous specimens nicknamed ‘meat-for-vegetarians’: mushrooms. Harissa is a wonderful Northern African spice paste made of smoked or dried chillies and garlic plus spices like cumin, coriander and caraway bound with oil. There are many different variations much like there is for the great Italian pesto and they go from mild to blow-your-head off on the heat scale. Sometimes tomatoes are even thrown in there. Are you thinking what I’m thinking? Yep, it qualifies for this month’s theme for Hobo Tuesdays – an event run by the very funny Michelle, from Thursday Night Smackdown. Every darn month I forget to enter the event but I’ve finally got it together! According to the rules the dish has to cost less than $5 and feed 2 people. Things you deem ‘pantry staples’ aren’t included in the cost. Since I was in Barcelona at the time I did the cost based on 5 euros. Breakdown: eggplant (80 cents), mushrooms (500g gram bag 2.20, I used about a third: 73 cents), tomato (30 cents), jar of harissa (1.40, I used a tenth: 14 cents), bunch of parsley (1 euro, I used half: 50 cents) and a bag of spinach (1.20, I used a quarter of the bag: 40 cents). I consider chickpeas, olive oil and garlic cloves pantry staples. Total cost: 2.87 euros. Not bad, huh? One last note on making this dish go even further. The recipe only uses half a can of chickpeas so here’s an idea to use up the other half of the can. Dry the remaining 200g of chickpeas really well with a clean tea towel or paper towels. Add to a mixing bowl, drizzle with a little olive oil and sprinkle with sea salt and paprika. Mix well so that all the chickpeas are coated in the oil and spices. Spread out on a baking tray in one layer and roast in a hot oven for 15-20 mins until crispy. Serve with a cold beer or glass of wine for pre-dinner nibbles. 1. Slice the eggplant in half lengthways and scoop out the flesh with a spoon. Leave a thin shell around the outside – see picture above for a reference guide. Roughly chop the eggplant flesh and set aside. 2. Brush the eggplant halves inside and out with olive oil and place on a baking tray. Roast in a hot oven (200C/390F) for 15 minutes while you make the filling. 3. Heat the remaining oil (about 2 tablespoons) in a frying pan over high heat. Add the garlic and chopped eggplant and stir constantly until starting to brown (5-6 minutes). 4. Add the mushrooms and cook until wilted (5 mins). Allow any moisture that is released to evaporate and then toss in the diced tomato. Stir to combine until the tomatoes have softened slightly (2 mins). Take off the heat and mix in the harissa, chickpeas and parsley leaves. Season with salt and pepper. 5. Spoon the mixture into the eggplant halves and bake for a further 15 mins. Transfer to serving plates – be careful as they will be half filled with delicious juices from the tomatoes and mushrooms. Serve on a bed of baby spinach. Yum Christie…what a good idea to incorporate the mushies in this dish! And the chickpeas and egglant are perfectly suited with the harissa! I love this….perfect for a side dish to a dinner party menu. Ooh, I drooled at that top pic! It looks so good. I’m such a huge fan of eggplant, this looks fantastic! I’ll definitely give it a go, thanks :) Btw, are you on holidays indefinitely?! Love the look of this! Stuffed vegetables always look so inviting and delicious :) hehe remember that ad for mushrooms with the tagline “Meat for vegetarians”? I like the idea of this frugal dish…and it looks delicious too!!! I am definitely trying this as well as drying my own chickpeas for a snack!! I love unfussy food, this sounds so great. 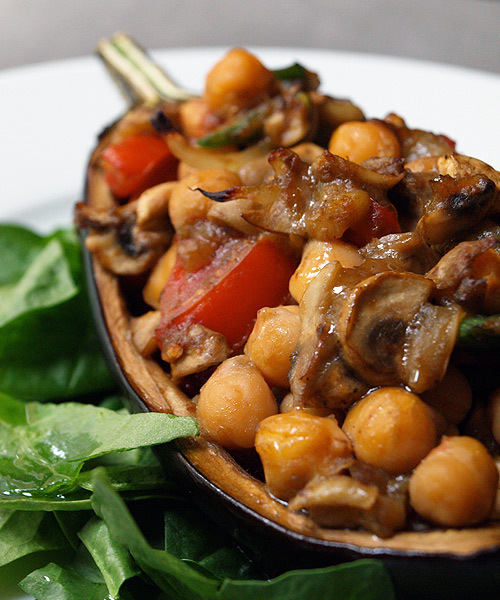 Harissa, eggplant, chickpeas…delicious! This is fantastic!!! Ever since i made Harissa the first time, I keep some in my refrigerator.. makes everything taste good. Love this recipe & the mushroom in it. Yum! I’m loving chickpeas at the moment…i’ve been throwing them in soups, stews and just about everything. Definately will have to give this a go. Photo looks great as usual. I love to see a tasty, spicy vegetarian recipe! I’ll have to try the dried chickpeas too. I’ve bought them before, but I’d love to try making my own. It’s impossible not to succumb to this spicy-vegan-heavenly goodness!! Wow that looks so beautiful and yummy. I love Harissa, in moderation of course!! A wonderful recipe! Bookmarked for future use!!! @Betty – Yes, we’re on a world trip – back home in December!